Those heading to Grand Isle to celebrate Labor Day weekend should take advantage of the area’s lighted docks to beat the heat while fishing at night. Along with the lighted docks already in operation, from the old bridge pier to both Bridgeside Marina and Sand Dollar Marina, a lighted wharf recently opened at the end of Smith Lane in the middle of the island. On a recent trip, Wesley Brown and I headed to the Smith Lane wharf after hearing the fish were biting. 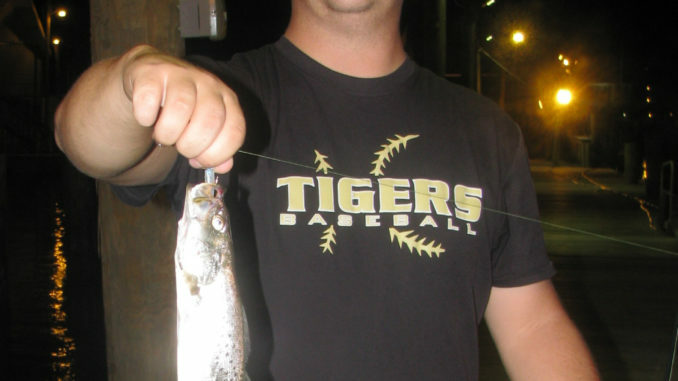 We arrived around 7:30 p.m. with light rods, a fly rod, tackle box, bucket and an ice chest. The low tide had not switched and the water was moving slowly. We caught five small white trout and threw them back. After struggling to catch legal trout, we headed to Sand Dollar Marina and walked to the end of the main dock. The tide had switched and the water was moving quickly. “Wow, look at all the fish hitting the water,” Brown said. We baited our 1/8-ounce jig heads with Bobby Garland’s baby shad in monkey milk and Strike King Mr. Crappie 2-inch shadpole in glimmer blue. Our cast and retrieve method varied from fast on top to slow and jig. It didn’t matter what we did, fish were hitting the jig. We laughed at the comment, but two hours later we had put 65 legal speckled trout and white trout in the ice chest.We estimated that we caught and released more than 300 fish in the two-hour period.